Veteran socialist George Fernandes, who was the defence minister in the Atal Bihari Vajpayee government, passed away Tuesday following a prolonged illness, his long time associate Jaya Jaitly said. 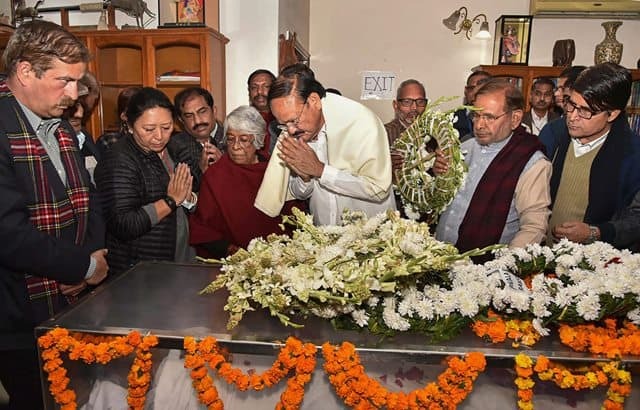 Fernandes was suffering from Alzheimer’s disease, which had forced him out of the public eye for last many years, and had recently contracted swine flu, she said, adding that he died at his residence here. He was India’s defence minister in the NDA government headed by Vajpayee when India fought the Kargil war in 1999. It was during his tenure that India conducted nuclear test at Pokhran in 1998. He was the industry minister under the Jan Sangh government which had defeated former prime minster Indira Gandhi in 1977. Tributes poured in for the veteran leader, with Prime Minister Narendra Modi saying he was frank and fearless, and never deviated from his ideology. Congress chief Rahul Gandhi expressed his condolences to Fernandes’ family and friends. “I’m sorry to hear about the passing away of former Parliamentarian & Union Minister, George Fernandes Ji,” he said in a Facebook post.